If you are struggling to stay within your budget or are spending more money than you should, it might be a good idea to go back to using cash for daily purchases. It is no surprise that most of us are beginning to move away from cash for everyday spending. The convenience of debit and credit cards is very tempting and some cards even offer rewards or cash back that make the use of cash seem even less appealing. The problem with this convenience is that you can easily begin to forget the true value of the money you are spending and end up having trouble staying within reasonable or budgeted limits. This is where using cash can help. When your everyday transactions are done by swiping a card, you don’t physically see the money change hands. I’m sure everyone knows what spending $2.00 on a cup of coffee feels like but the fact you only see this number in the form of a receipt or on the cash register display doesn’t have the same effect has reaching into your wallet or purse and physically handing the money to someone else. The problem lies within the way we think about money in each scenario. When you use an electronic form of payment you are only restricted by the amount of money in the bank or the available credit on the card, which should hopefully be more than you are (or should be) spending. Throughout the week when you are spending money on groceries, gas, your morning coffee, or lunch out with co-workers, you don’t realize how much each small purchase is adding up unless you are balancing your checkbook immediately after each purchase. What's a checkbook, you ask? That's precisely the problem. 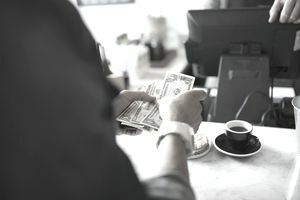 Though checkbooks are now almost obsolete for most of the population, the one thing they do even in their inefficiency is ensure that at all times, you know exactly what is in your bank account and what you've spent and where. On the other hand, if you were to use cash for these same purchases, you would have a clear idea of the consequences of this spending without even thinking about it. If you started the week with $40 in your wallet and began to use that for all of your purchases you would see this $40 turn into $35, $25, $10 and so on. You are reminded of how much you have spent and how much money you have left every time you look in your wallet. This alone can make you think twice before making a purchase, which is the first step to getting your spending under control. Credit cards are not evil. In fact, they can be a great financial tool for building a good credit history, getting an interest free loan (if you pay the balance each month), and earning perks, rewards, and even cash back. Plus, they are very convenient. But it is that very convenience that you need to be wary of when your spending is out of control. So consider trying the 30-day cash challenge. While you can continue to pay certain fixed bills with a credit or debit card or auto-withdrawal from your bank account, the challenge is to use cash for all regular daily purchases for 30 days. Morning coffee? Use cash. Groceries? Use cash. Lunch out? Use Cash. Happy hour? Use cash. The idea is to limit all of your variable and discretionary spending, that is the spending that you have control over, to cash transactions. You may find that you are more mindful of the money you spend. You may even find that you spend less as a result. To begin the 30-day cash challenge, you must first create a weekly budget for how much cash you think you will need throughout the week. Are you still going to get that special coffee creation or will you have a cup at home or the office? Are you going to eat lunch out every day or pack a lunch some days? Consider all the spending you will need and want to account for, take that amount out at the ATM, and get your week started. Whether it is $20 or $100, only have the amount of cash that you have budgeted for and use this cash for all of those everyday expenses. You may even consider dividing that cash into separate envelopes, earmarked for certain types of spending like groceries, eating out, entertainment, etc. That way, you'll get a solid sense of where you run out of money first! After one week, how did you do? Did you find that you had money left over or did you have to pack a sack lunch on Friday because you spent your last dollar on Thursday? Try it for a few more weeks to get into a rhythm or habit. Regardless of the outcome of the challenge, you should have a very real sense of where your money is going throughout the week, and as a result, you will be in the position to put together a realistic and meaningful budget. Of course, there is a reason that it's the 30-day cash challenge and not the 30-year cash challenge. Going all cash isn't a smart financial move in the long-term. Once you've completed the challenge to your satisfaction, it's time to create a budget and decide how you'll keep yourself accountable. You may decide that you want to continue to make certain everyday purchases in cash to limit spending in that "category." Or you might decide to opt for a personal finance system to log and categorize all of your spending on credit cards and cash. Either way, one month of using cash should help get your spending back on track.